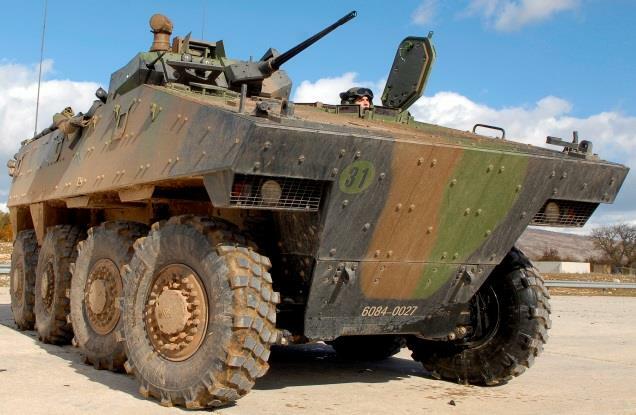 As part of the Land Army's equipment upgrade programme, the VBCI programme was awarded to Renault Véhicules Industriels and GIAT Industrie in 2000. The VBCI is designed to transport a group of 11 men and equipment, with one driver and one commander (gunner), close to the combat zone. Intended to replace the AMX 10-P, this highly versatile vehicle is suitable for both peace-keeping operations and for combat engagement. Transportable by air, there are several versions: VPC (Command Post Vehicle), VCI (Infantry Combat Vehicle), VTT (Troop Transport Vehicle). With 8 independent driven wheels, it has a top speed of 100 km/h and a range of 750 km. Arquus provides the entire mobility part of the machine (engine, gearbox, suspension, drive train, driver's compartment etc.). The 400th example was delivered to the Land Army in 2012, and the 630th and last example in March 2015.